Designed for the latest generation of cars where comfort, high-speed stability and safety are the essential requirements. This Tire includes a technological platform that gives a special footprint (contact patch) making this model a reliable tire that is secure on wet surfaces, assured when braking, quite on the road and resistant to all types of road stress. The benefits are more grip and total stability with less tire fatigue and thus longer mileage. This model reduces fuel consumption and atmospheric pollution. Fuel Efficient compound provides low rolling resistance which enhances fuel efficiency. Reliable traction in multiple driving conditions for year-round performance. 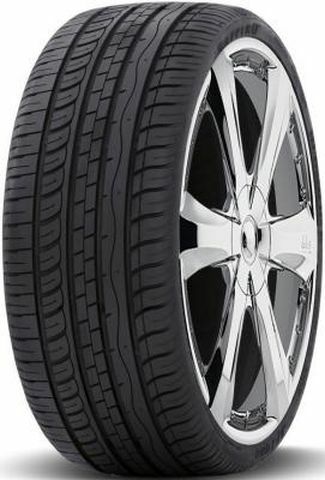 P275/25ZR-26 N/A 1,764 lbs 49 psi 10/32nds N/A 11" N/A 32"
Purchase includes the Saffiro SF7000 tire only. The wheel rim shown in the picture is not included. Picture provided is a stock picture from the manufacturer and may or may not reflect the actual product being ordered. All Saffiro SF7000 tires are continuously developing with manufactured improvements. With that said, Simple Tire and the manufacturers have the right to change these tire specifications at any time without notice or obligation. Please Note: Specifications of the Saffiro SF7000 tires shown above are listed to be as accurate as possible based on the information provided to us by Saffiro tires.